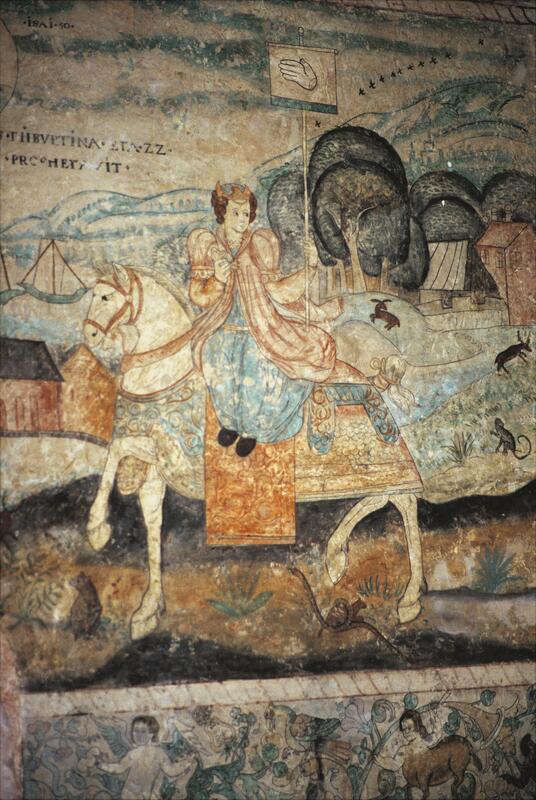 Part of a painted procession, this woman and her steed march across the interior walls of la Casa del Deán, a private house in Puebla de los Angeles, Mexico. One of the oldest houses still standing in Spanish America, it is famous for its painted walls. This figure is one of the oracles of the Classical period, who were believed by later European intellectuals to have uttered prophecies that foretold the life of Christ. The sibyls appear in many 16th century artworks, such as Michelangelo’s Sistine Chapel ceiling. This one is the Tiburtine Sibyl, her name and age written in Latin to the left of her head, as she carries an icon of her prophesy on a banner. This version of the sibyls, shown as a procession on horseback, comes from the Triumphs of the Renaissance author Petrarch (1304-1374), which may have reached the New World in illustrated form. The Sibyl’s horse seems resolute in its concentration, the Sibyl herself, in contrast, looks behind her to see the next prophetess in line. A frieze of animals, flowers, and centaurs appears below, and stylistic conventions developed in pre-Hispanic painting can be seen quite clearly in these images, like the monkey wearing a jade bracelet partially visible at the corner. This suggests that the muralists were indigenous painters who had studied European prints and imagery. The house was built for was Tomás de la Plaza, the third dean of Puebla’s church from 1564-1589, and thus the house is known today as Casa del Deán. At that time, many indigenous painters were employed to decorate the walls of newly built churches and monastic complexes in and around Puebla and Tomás de la Plaza likely recruited them to work on his elegant house. The images, which may have been inspired by book illustrations, were probably drafted on the wall, but their condition, and the absence of visible guidelines, makes the artists’ techniques unclear. Pigments were applied directly to the wall, but seem not to be true fresco, where paints would be absorbed into the plaster when wet. For many years, these paintings were covered (and protected) by a thick layer of whitewash. They were rediscovered in 1933-34 when the then owner of the building undertook renovations. Although parts of the building have since been destroyed, the room with this mural is largely intact and is exceptional today because few such domestic murals survive. It is currently a museum and open to the public. These murals were commissioned for an intellectual of New Spain, and the presence of Classical imagery in his house reveals his desire to be surrounded with the images and symbols of “high culture” and Renaissance erudition—a desire that did not dissipate when he crossed the Atlantic. Few such murals survive today, but in the 16th century, they were among many works that bound the visual culture in the domestic spaces of well-educated men in New Spain to their counterparts in Europe. Photo: Banco Mexicano de Imágenes. Used by permission of the Instituto Nacional de Antropología e Historia, Mexico; all rights reserved. Gruzinski, Serge. 2002. The Mestizo Mind: The Intellectual Dynamics of Colonization and Globalization. New York and London: Routledge. Morrill, Penny C. 2014. 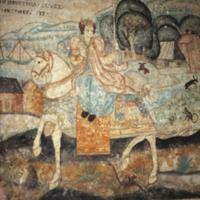 The Casa del Deán: New World Imagery in a Sixteenth-Century Mexican Mural Cycle. Austin: University of Texas Press.